Re-published in 2013 as Zoo Station: The Story of Christiane F.
In the spring of 1978, Horst Rieck, a journalist for the German weekly Stern, attended a court hearing in Berlin Moabit. Rieck was doing research about the Berlin drugs scene at the time, and the court case about a businessman who was accused of having paid underaged prostitutes with heroin seemed a good opportunity to get some extra details. Little did Rieck know that his encounter with one of the witnesses, the fifteen-year-old Christiane Felscherinow, would have long-lasting consequences. After the court hearing, Rieck asked Felscherinow whether she would be willing to be interviewed, and Felscherinow agreed. The planned one hour-talk grew into two months of interviews, conducted and taped by Rieck and his journalist-colleague Kai Hermans. In the fall of the same year, the two journalists published Felscherinow’s story, based on the recordings under the title: Christiane F. – Wir Kinder vom Bahnhof Zoo. The book is the raw and uncensored tale of a Felscherinow’s life and that of her friends Stella and Babsi. Felscherinow started using drugs when she was thirteen, and at fourteen she was addicted to heroin. To buy the drugs, she committed petty thefts and finally, when that didn’t yield enough money for her increased drug use, she sold her body. She still attended school in the mornings (her mother didn’t know about her addiction until two years later) but each afternoon she and her friends would walk the streets around the Berlin train station Bahnhof Zoo, the infamous ‘Children’s Strip’. The book caused an immediate sensation and made Christiana F. into a cult figure. For the first time, the real-life story of a young drug addict and child prostitute had been made available to the public. It’s now hardly imaginable, with the so-called ‘war on drugs’ going on for decades, but in the 1970s drug addiction among teenagers was not a topic that was publicly talked about or even acknowledged. At least not in Germany. It’s therefore hardly a surprise that the book became a bestseller. It was translated into fifteen languages and sold over three million copies worldwide. In Germany, it became the most popular nonfiction books published after the war and for years; many German schools added it to their mandatory reading list. The book’s impact increased even more after it was made into a movie two years later. Directed by Ulrich Edel and with the title role played by the fourteen-year-old German actress Natja Brunckhorst, the film didn’t try to sugarcoat the book's story. On the contrary. Addiction, withdrawal, and prostitution are portrayed more realistically than in many recent Hollywood movies. Still, the film was also a commercial success, not least because David Bowie supported it and composed the soundtrack. For many people of Felscherinow’s generation, the song Heroes will forever invoke images from the film, particularly the scene in which Christiane gets her first fix in the Berlin club Sound, or the one in which her best friend Babsi overdoses in a filthy toilet of the Zoo-train station, only days after her fourteenth birthday. Nowadays, teenage drug use and child prostitution are well-known facts, lamented and bemoaned by politicians and the public alike. 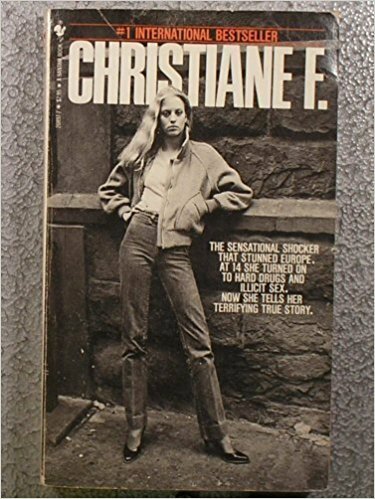 But that also means that forty years after its first publication, Christiane F. still hasn’t lost its relevance or its urgency. Unfortunately.